Look what I got to quilt! 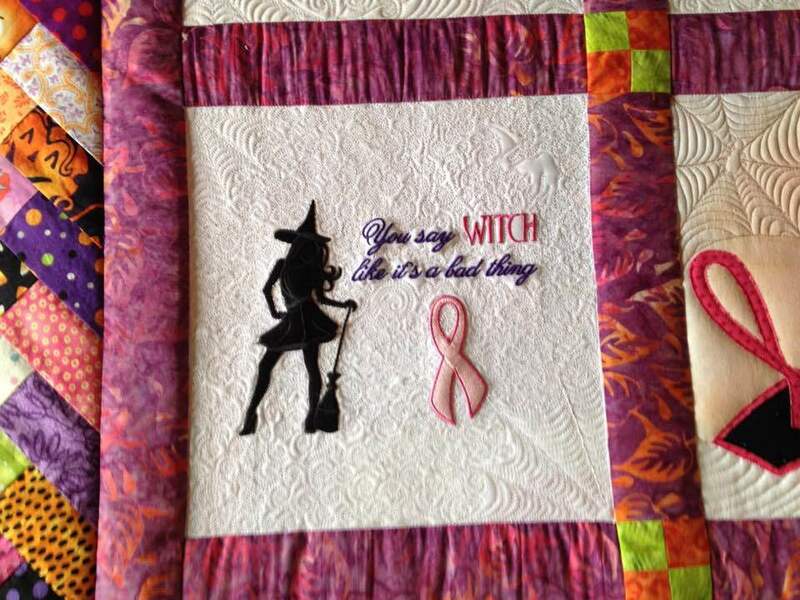 It's a pink themed Halloween quilt, to display at our local hospital during the month of October. Pink because it's breast cancer awareness month. 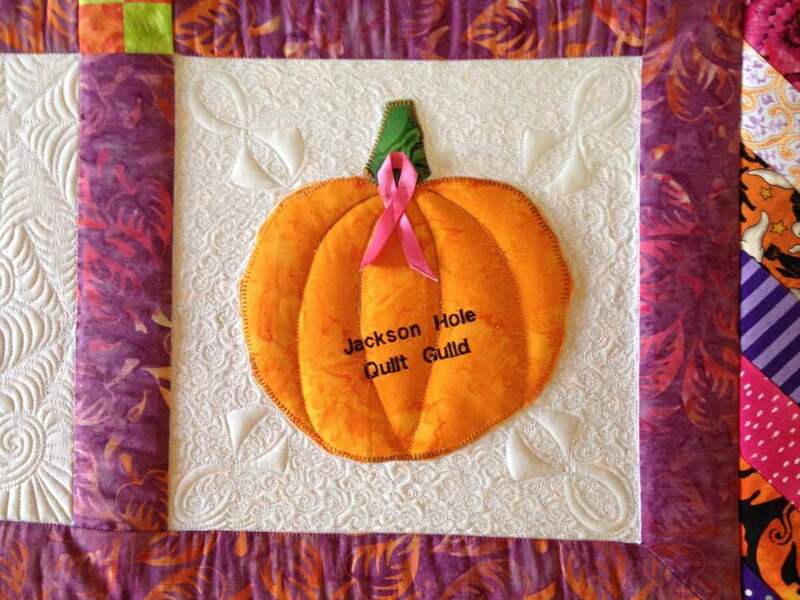 The Jackson Hole Quilt Guild rotates a quilt display every month at our local hospital. The nurses and patients really appreciate it. 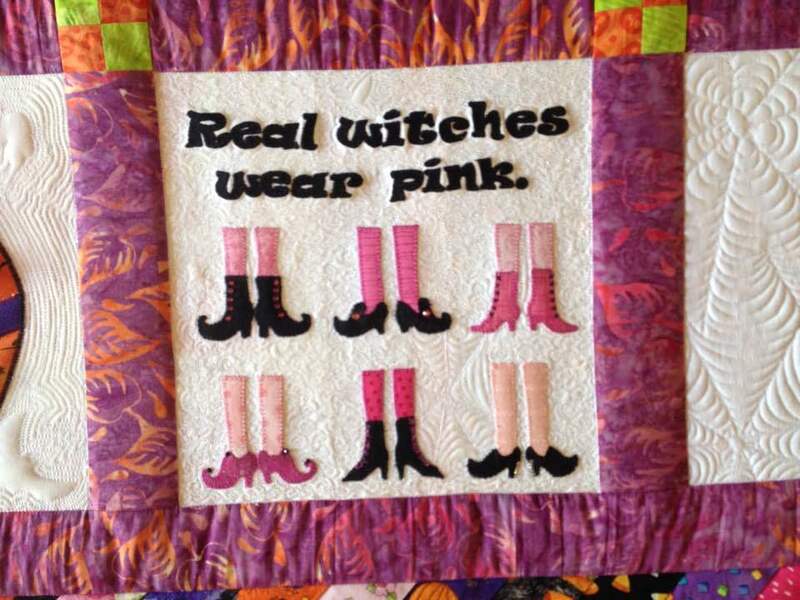 We've had a hard time in years past trying to find a pink quilt for the October display. So we had the bright idea to make a quilt just for that. Different people made the applique blocks, others sewed them together with sashing and border. I quilted it, and just handed it off to another member to attach the binding. A terrific collaboration. Last May I took a few classes from Judi Madsen in Salt Lake City. I just LOVE her work. 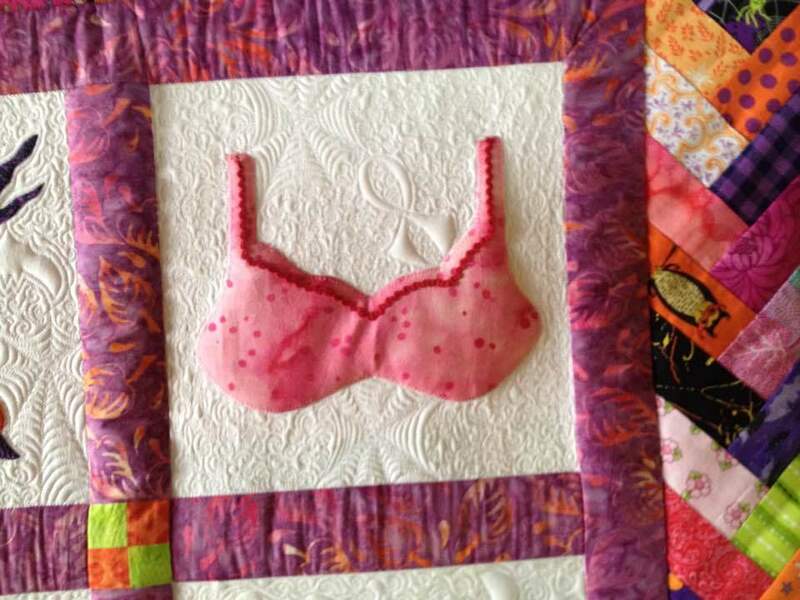 So, you will see that she inspired this quilting. 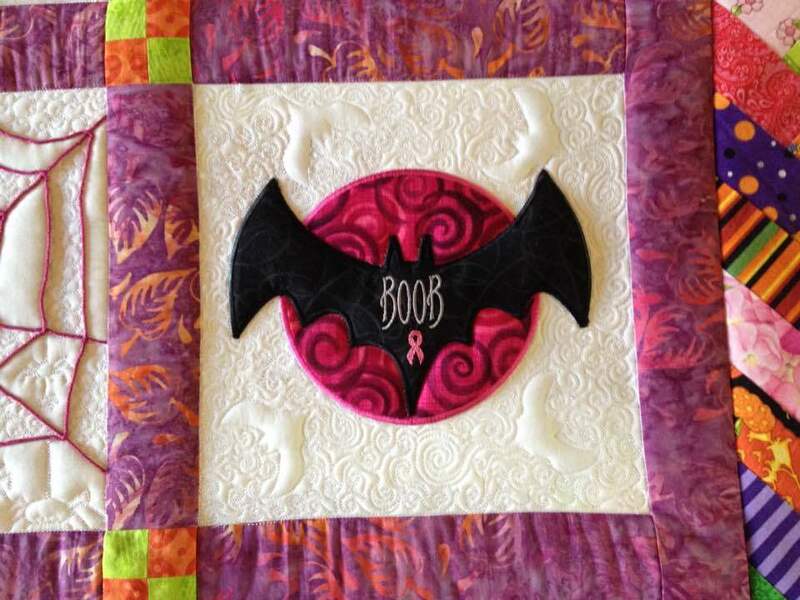 The bat bra block is the one that really got me started with the quilt designs. 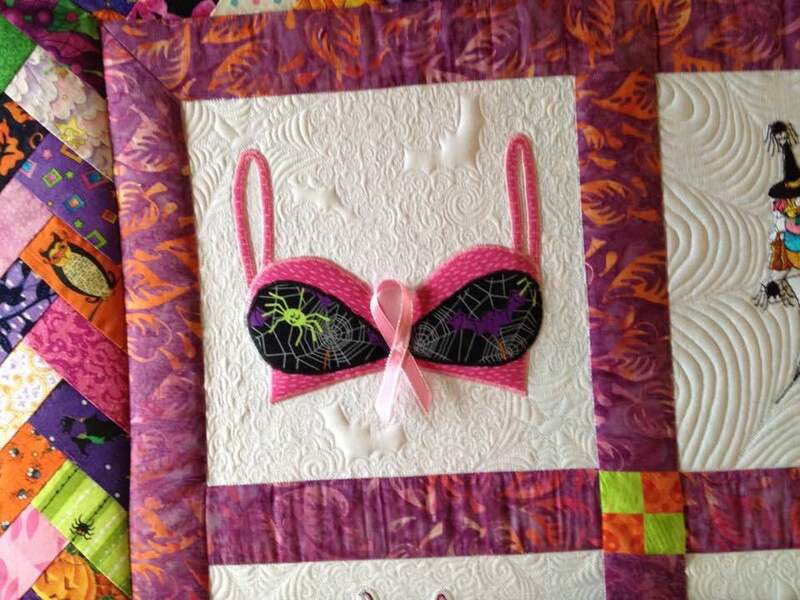 The lady who made it drew a spider in a web on the cleavage, so clever and so easy to quilt that design! Judi had just posted an applique quilt that she'd finished that had bugs in it. 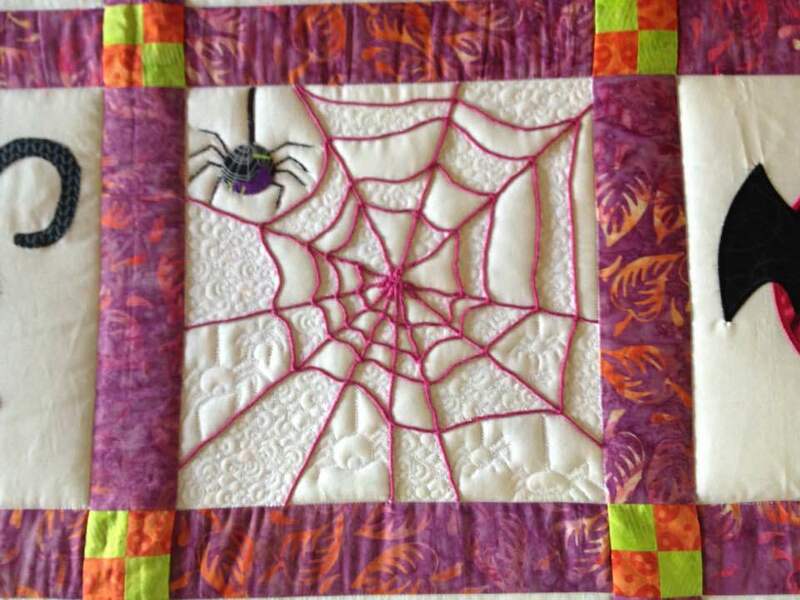 She gave the bugs motion by quilting a swirly design under them. I thought the ghosts need that swirly design too. Remember, imitation is the sincerest form of flattery, right?! I used a wool batting, glide thread with magna glide bobbins. Love those magna glide bobbins! Angela Huffman is a great source for them and her delivery is super fast. What a cute quilt!! The quilting is perfect. This quilt is just so neat! I absolutely love everything about it! Ya'll did GREAT!!!!!!!!!!!!!!!!!!!!!!!!!!!!!!!!!!!!!! Thanks for posting all the closeups. This quilt is incredible. My daughter and I just adore this quilt. Everything, and I do mean everything, about it is just fantastic. 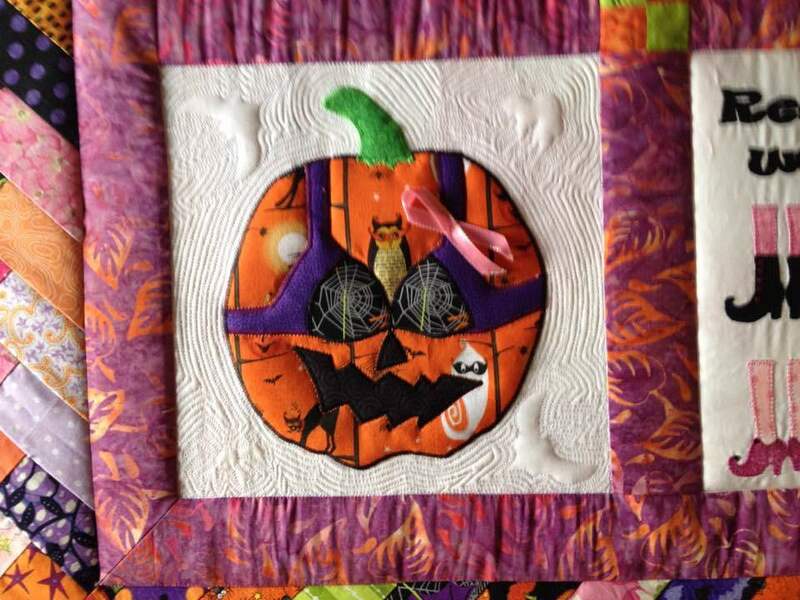 We love Halloween and a Halloween quilt to support breast cancer awareness is just awesome. Just love it. P.S. I want a bat bra. I absolutely love it, Annie! Great work for a great cause. Gorgeous quilting! Bravo! 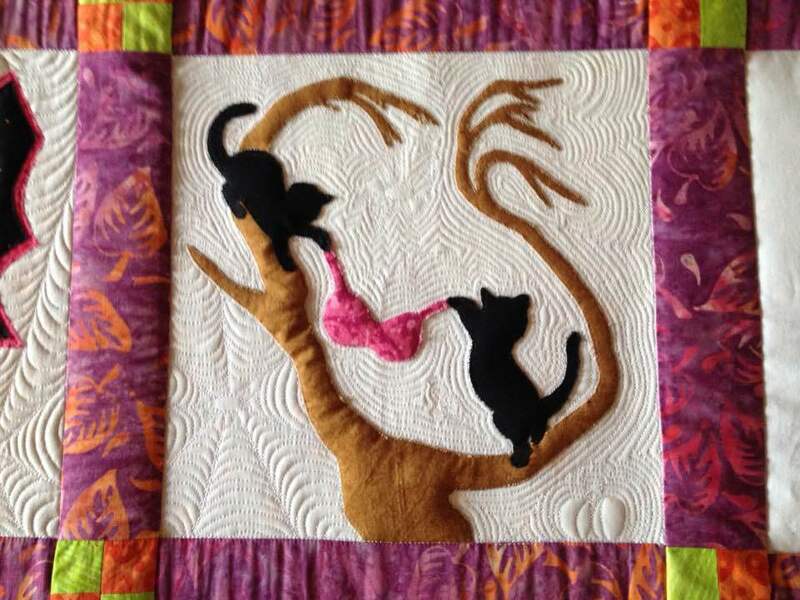 The imagination and creativity in this quilt is amazing. Not only that, the quilting is spectacular. AWESOME! 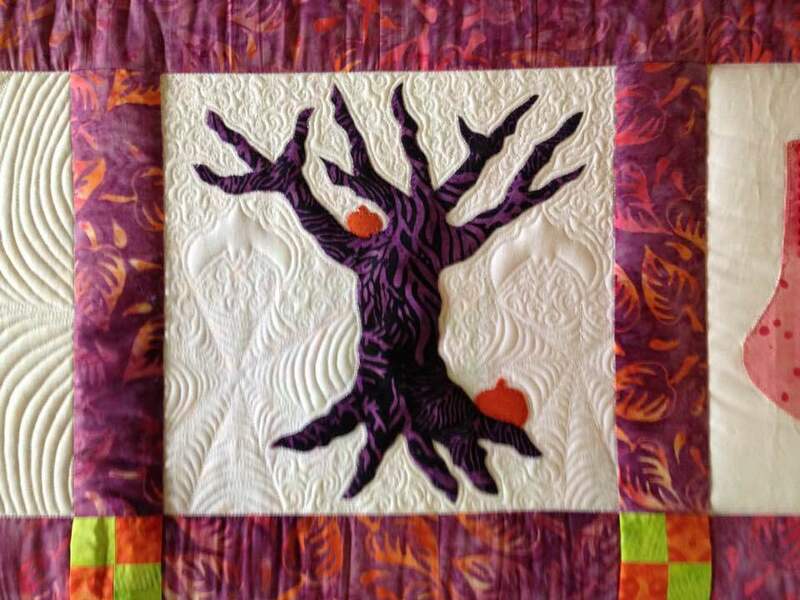 It is a wonderful collaborative quilt, and your quilting is outstanding. It brings both a funning and serious side to the Halloween month. Great job, and thank you for sharing. Absolutely fantastic! 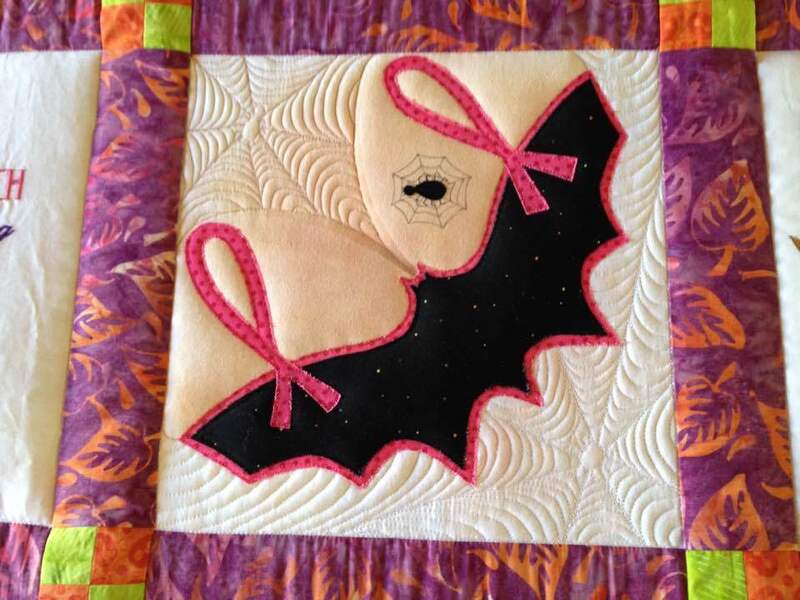 Very creative, I love all the details, and I love pink but would never have thought of a pink Halloween quilt. Being a breast cancer survivor, this is extra special to me. And yes, I want a bat bra too! 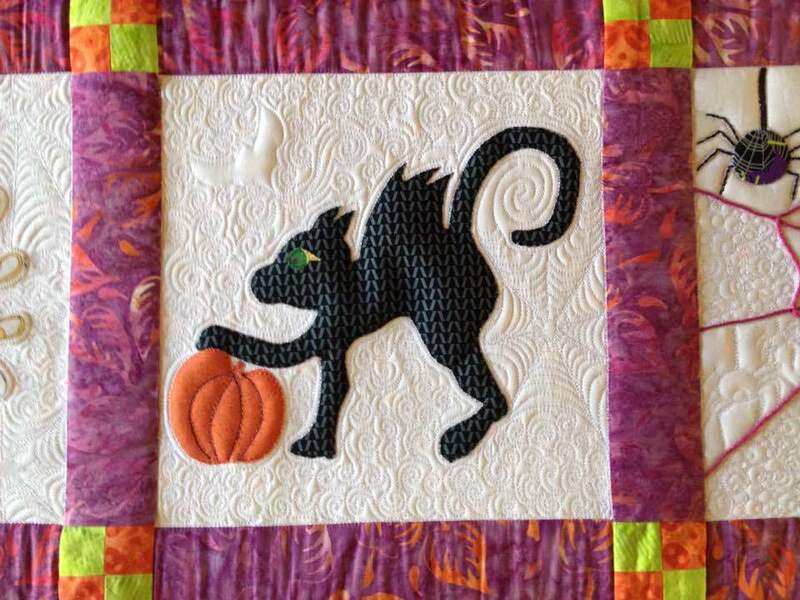 Love it, and the quilting is perfect! The quilt is absolutely fabulous and the quilting is perfect too. I love everything about it. Great Job. What a darling quilt! And your quilting is exquisite! This is a huge smile full of whimsy! Your quilting does a lot to enhance it, too. I just took Judi Madsen's class on fillers this week at QuiltWeek Paducah, and I can recognize her influence on your designs. ...always practicing on my "Lucius", always learning! What a fun quilt to make and to quilt! Absolutely over the top in every way! Well done! Awww this is awesome for display. 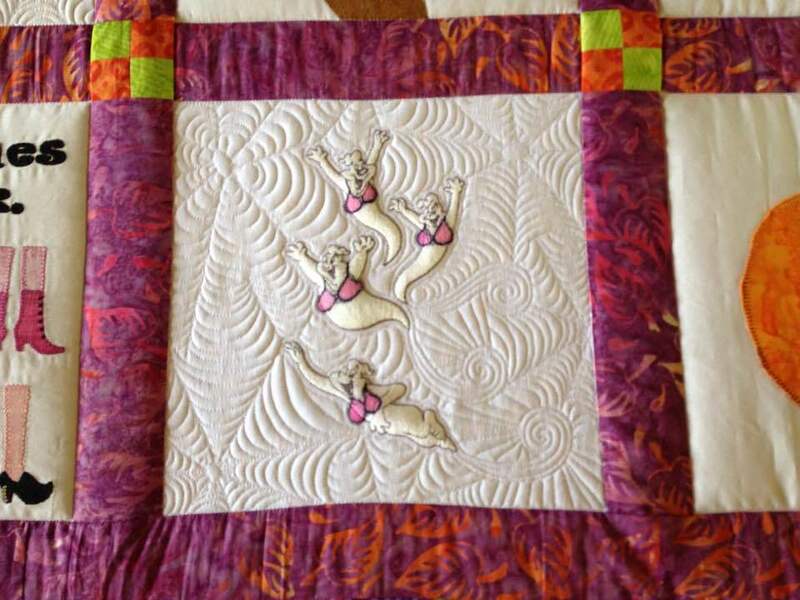 Wonderful design and perfect quilting! 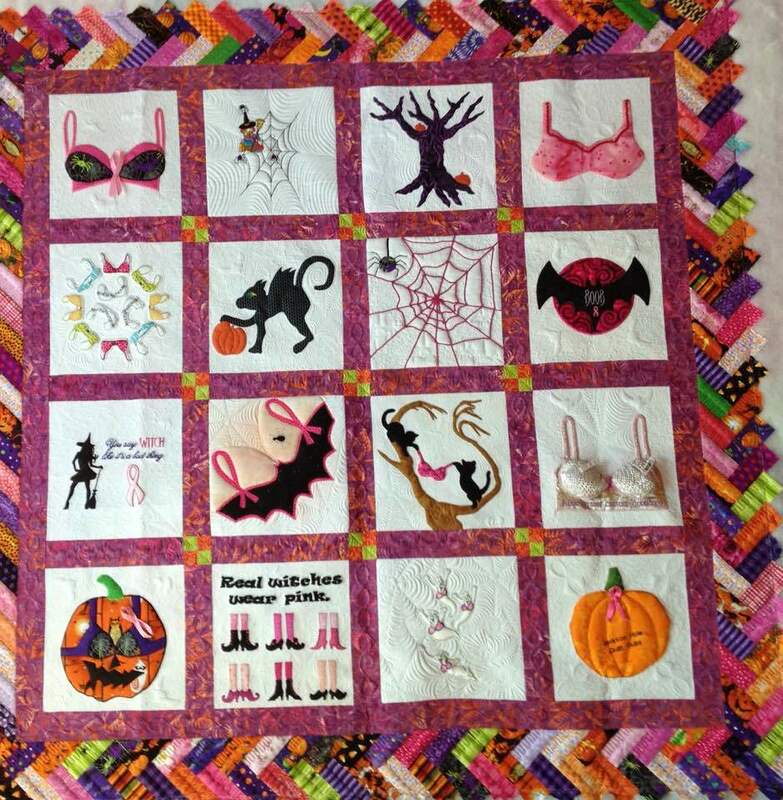 Love the quilt for Breast Cancer and love the fact that it is also Halloween at the same time!!! Your quilting is amazing! 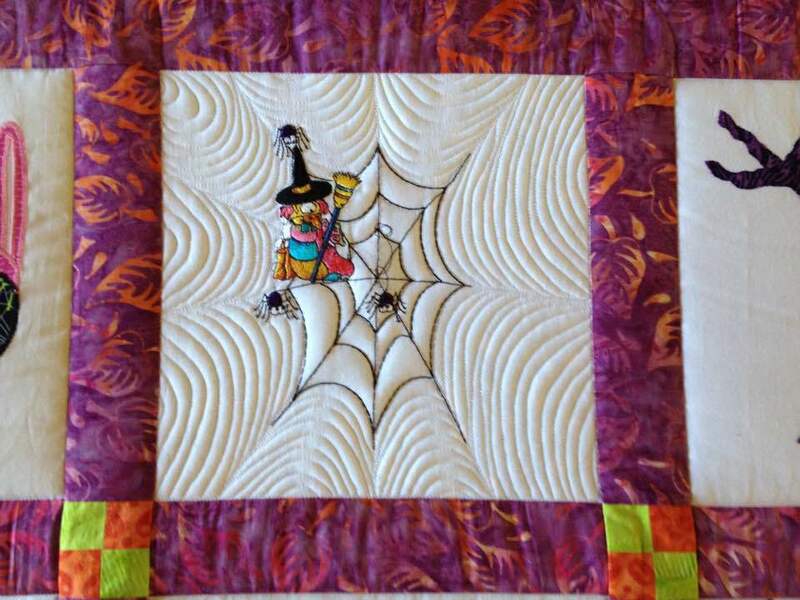 Love the quilted spiders in the web. 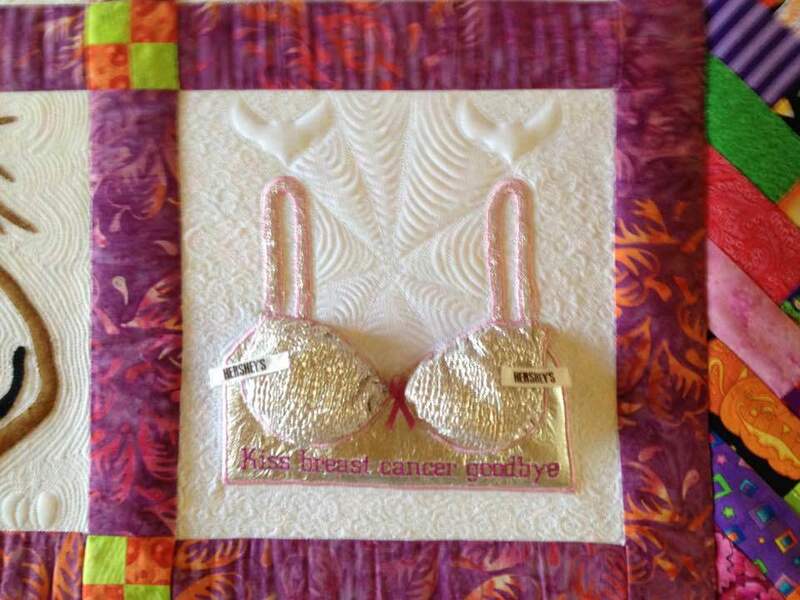 Not a Halloween fan, but My sister passed of Breast cancer SO I LOVE what you are doing for cancer. AND PLEASE ENTER THIS SOMEWHERE!!! AMAZING QUILTING! Such a cute quilt and your quilting is wonderful.